Let us start by thanking you for your service. Many take for granite calling 911 in case of emergency, never stopping to consider the workings that are in place by our emergency management system and the men and women who serve, here we wish to acknowledge that commitment. If you have reached this page you could be looking to establish Pet Oxygen Masks in your company, congratulations on an excellent idea! We would like to visit our pages on "Standardization" so you can see our efforts to meet you criteria. Please visit the "Mask & Kit info" to answer any questions on what's in a kit. Or visit the page titled "Training Video" for further information on their use and as a tool for regulating protocol. One of the number one reason first responders reach this page is because you are looking for information on how you can request these kits. While the word "grant" is typically associated with this kind of request we do not offer grants, per say. That means every department asking for help can receive it! The available of kits is subject to the amount of time it takes to raise your funds. Station Chiefs, Captains, EMS and other department heads please "Contact" us with the number of front line apparatus's you run, or in other words the number of Pet Oxygen Mask kits you are requesting. In California we have been establishing them on front line engines, however in Eastern states we tend to establish within the ambulatory services. How you choose to carry them has no bearing on your request for equipment. We will put together a public request for kits, and with a little "social media" sharing your funds should be raised for you in no time at all! Your kits and shipping are of no cost to your department and no further contact is made on our end to your company. However, if you have any questions regarding Pet Safety you may contact us at any time. We have answered to your concerns the training video was writing by two Pet First Aid and CPR instructors, both our "Board Members". Chief Bill Metcalf, President of the International Association of Fire Chiefs (IAFC). Supports the Emma Zen Foundation and Pet Oxygen Masks. We are so proud to have been nominated for 2013 the CNN Awards by Chief Bill Metcalf! Thank you for your trust and believe in all our efforts. Pet Oxygen Masks kit fit all kinds of household sizes pets and it's true you'll never know what you'll find! This little person to your right is Baby Banks, another foundation member. We have seen the kits being used on a variety of pets. We educate the public on what is a public services emergency and give them suggestion to precautions they can take to help themselves. View our "Alerts and Safety" info. We know that you are commitment to saving life and property, though for some there are questions regarding the liabilities of saving pets. If you have any questions or concerns please "contact" our president. If you are a pet lover, you understand. If you are not all you need to know is that our pets are our family. Plain and simple, they are our family. Many of us layman believe as you professionals that, a life is a life! Thank you for saving ours. Even Fire Fighters and other first responders donate, volunteer and/or find other ways to help our organization. Many of them are at no monetary cost to you! Please explore our options below. 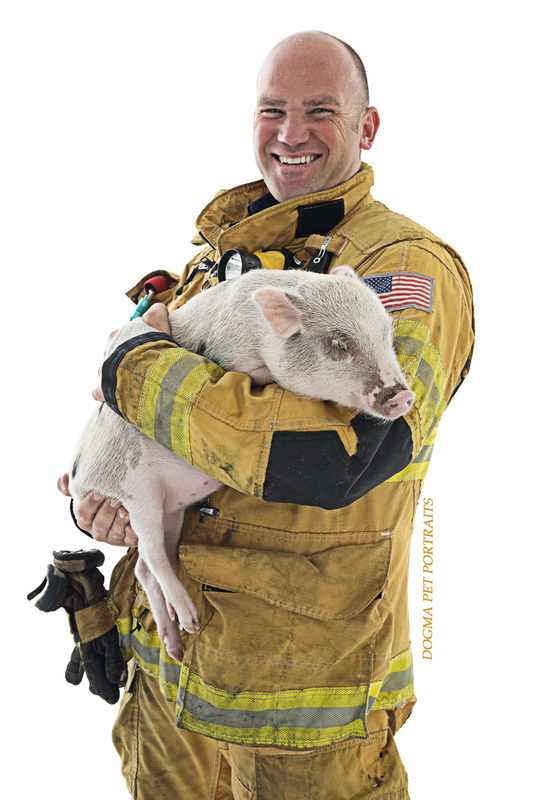 Fire Fighters give more value to Pet Safety and Pet Oxygen Masks!